Carbon deposits build up inside the intake manifold, around the valves, in the throttle bodies, and just about everywhere inside the engine. Periodic cleaning of these deposits can cure idle, hesitation, and several other problems if they effect air flow. These deposits are there due to the vehicle's EGR system (exhaust gas recirculation) and cannot be avoided unless the EGR system is removed and/or it is reprogrammed by Jim Wolf Technology. This is being done on my '90 NA. 1. It's probably a good idea to do this outdoors in a well ventilated area. I've cleaned the throttle bodies indoors in a parking garage once and doubt I'll try it again. Find a ventilated place to do the job, open the hood, disconnect the negative battery terminal, and locate the two throttle bodies. 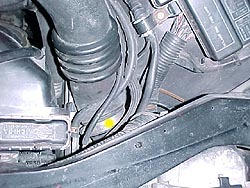 There will be two black intake hoses leading to them (highlighted in yellow 1.). On the non turbo models, these hoses are a hard plastic material that can be difficult to remove if cold. I've found it easier to remove if the engine has been driven for a few minutes or use a hair dryer to heat them up. 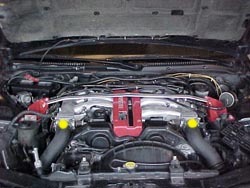 On the twin turbo models, the intake hoses are a softer rubber material and is easier to pull off (2.). The next step is to loosen the hose clamps attaching the intake piping to the throttle body. It's not necessary to remove the hose clamps, just loosen enough to pull the tubing off. 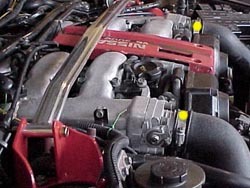 It's also a good idea to loosen the two hose clamps down further (highlighted in yellow 3., the turbo intake hoses are much shorter.). Once the hose clamps are loose, pull off the tubing from the throttle bodies and push them off to the side for non turbos or totally remove them for turbos. Stick a rag in each open end so nothing gets in the open intake pipes. 2. 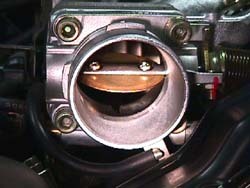 Stick a rag or a few paper towels under the throttle body since a lot of fluid and debris will flow out while cleaning (4.). It's easier with a friend helping since they can sit inside the car and hold the throttle open via the accelerator. If doing this alone, manually open the throttle body butterfly valves. Roll the throttle cables backward through the hole in the front of the trim cover and wedge a screwdriver in front of the cableway to hold it open (5.). WARNING: Make sure that the little red plastic tube that comes with the throttle body cleaner stays attached to the can itself! I've had it fly into the manifold once... 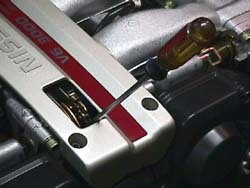 If you purchase the Valvoline throttle body cleaner, the small tubing is attached to the can so no worries there. If this should accidentally happen, remove the balance tube on the back side of the plenum, the tube should be accessible through the top holes there. Cleaning may take 4-7 cycles, depending on the amount of carbon that has build up. 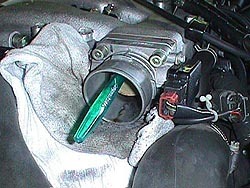 After one side is done, put the intake hoses back onto the throttle body and tighten up the hose clamps. On the non turbo models, this may be more difficult, since they can be tough to force back on. Twin turbos shouldn't be difficult because the tubes are much softer. Once the hose is back on, tighten the hose clamps. Repeat the process for the other side. 4. Once both throttle bodies are clean, clean up any grunge left, put the negative battery terminal back on (the ECU should be reset by now), and start the car up. It may take several tries before the car will start, don't worry if it won't fire up on the first several tries. Once running, it will probably have black exhaust smoke. Don't worry, this is also normal. Let it idle for a few minutes then take a quick spin around the block. Some people may experience a slightly higher than normal idle. If this is the case, don't worry about it because it should return to normal once the ECU is able to readjust to the new air flow properties. Mine took about 250 miles before the idle stabilized. There you go! The throttle bodies are clean and should be fine for another 12,000 miles or one year.